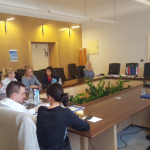 An initial conference of the Project Virtual and Cultural Tourism – ViCTour was held on August 29, 2017 in the premises of the Vukovar-Srijem County in Vukovar, where the Project was presented to the public. Marija Mišić, Project Manager, emphasized the value of the Project – EUR 924,327.00 of which the Vukovar-Srijem County, as the Lead Partner of this Project, disposes of EUR 280,000.00 . The Project aims to develop attractive, dynamic and competitive tourism offer by using IT tools such as holograms, virtual and augmented reality, interactive totems and such to enhance cross-border tourism and ensure better management of cultural and natural heritage of the region. On behalf of the Vukovar-Srijem County, all the participants were welcomed by the Deputy Prefect Mr Josip Dabro. He supported the Project and stressed the importance of the contribution of the Project to the cultural heritage of this area that needs to be constantly developed. Partners in the Project are the Tourist Board of the Vukovar-Srijem County, Vojvodina Tourist Organization, Faculty of Economics in Subotica and European Affairs Fund of the Autonomous Province of Vojvodina. Representatives of partner organizations gave speeches, and the Director of the Tourist Board of Vukovar-Srijem County Mrs Busic Srpak said she believed in the great interest of tourists in this Project that will be implemented in the area of tourism. 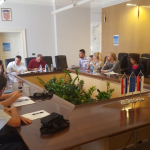 The first project team meeting of the ViCTour project took place in Vukovar in the Small County Hall, on September 6. In Vukovar, the Vukovar-Srijem County as the Lead Partner is cooperating with the Tourist Board of the Vukovar-Srijem County, Vojvodina Tourist Organization, Faculty of Economics in Subotica and European Affairs Fund of the Autonomous Province of Vojvodina. The project team members were confirmed at the meeting and all the activities of the first implementation period of the project were presented. The project team members talked about the issues they encountered during the implementation of the activities of the first project period and agreed on further steps in implementation, including the submission of the Project Partner Report. All representatives of partner institutions participated in the meeting.